We all need oxygen for survival. I remembered that in late year 2000, “oxygen bars” have sprung up in the US and Japan. However, the trend fizzled after a while. Some believe that by taking high level of oxygen will help them feel refreshing and soothing whereas some said breathing pure oxygen would be doing harm to the body, in fact, worse than drinking alcohol. While these points remain to be debatable and oxygen bars have since closed down, another product called OXIA, a personal oxygen dispenser, has hit the market since year 2006. Before getting excited with this new invention, OXIA, let’s understand the basics. We have three major gases in the atmosphere, namely Nitrogen (78%), Oxygen (21%), and Carbon Dioxide (0.03%). When we have more carbon dioxide in our lungs, the so called carbon-dioxide sensors in our bodies will send signals to the brain, including the feeling of suffocating. So, was the Vancouver-based OXIA invented based on this theory? Actually, the founder came out with this idea after he visited high pollution countries in Asia. He believes that one needs to pay for clean air eventually. So, he started this venture hoping get a fortune when the day comes. Now, to store oxygen in a portable form and sell it – simple idea? Yes, but not so easy to do so. 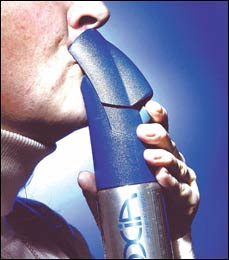 Unlike oxygen bar, Oxia is packaged in canister (cylindrical container for gases) form. From engineering and design perspective, metal cylinders containing pressurized gas are a potential hazard (may explode if not properly done). So, after many attempts, the founder finally made Oxia conforming to strict specifications set by the authority. I have no idea whether what it claims is scientifically true. If you have more information on this, I would like to know. Is the company is trying to tell (or mislead) us that we need more oxygen to prevent cancer? For skin – May help to promote better blood circulation. For stomach – Oxygen assists in breaking down food and helps the metabolism and aids digestion. For legs – Professional athletes regularly use oxygen to extend their limit of exhaustion and promote faster recovery. Fortunately, the company is honest by not promoting Oxia product as the hangover cure which the oxygen bars used to do so as the marketing gimmick. The founders said that he preferred to pair the product with the notion of a healthy lifestyle. Fair enough. So, put things in a nice way, the company does not really offer concrete proof that inhaling mostly-oxygenated air will produce any noticeable effect. I understand that oxygen is used by many people with serious illnesses in hospitals. In fact, friends told me that they have seen it given to people who were panicking at scuba diving sites as a sort of rapid tranquilizer. They believe that inhaling oxygen causes them to feel more relaxed and less anxious. Some also say that they are more relaxed outside from the city, like at seaside. This relaxing effect in natural environments might be caused by the difference in oxygen ratios. I have not tried Oxia yet, but, I believe that it can be challenging for beginner to use it. If you look at the canister, it has a plastic mouthpiece that slides upward. Based on what I read, Oxia’s engineers initially wanted to attach a mask to the cylinder. But, this design would make the product too cumbersome for carrying. They finally settled on a plastic mouthpiece that slides up to reveal a pinhole from which the oxygen flows. Once the lips are placed over that opening, a trigger can be squeezed to start the surge of oxygen. Some extremist believed that Oxia would do harm than good. Personally, I do not think that it is doing any good and I doubt it will hurt too. Its benefit can be more psychological than genuinely physical. If you want to give Oxia a try, you have to get it from the US, Canada, Taiwan, Japan, Mexico and Norway. It is sold mainly in hotel (in rooms or given as complimentary item in luxury hotels), pharmacy, clinics and spas. The price is about U$60 for a 120 mm cylinder size (6.1 gallons), U$70 for 150 mm (8.2 gallons) and U$90 for 180 mm (10.6 gallons). Depending on the size, each canister provides about 30 to 40 deep breaths of pollutant-free oxygen. Good thing is that the Oxia dispenser is reusable and refillable, so customer can return the empty units to the place of purchase for a new one. The refill is about U$15. Do not ever bother to find it in 7-Eleven. May be that is the company’s intention. It never wants to sell to everyone on the street. It is meant for the rich and famous. It is sold for customers luxury hotels, as a cure for jet lag. If you travel to Canada, you can find personal oxygen at the Vancouver Pan Pacific, the Vancouver Opus, Montreal Place D’Armes and various Westin owned hotels. The company also said Aerosmith singer Steven Tyler and New York Giants defensive end Michael Strahan are among its celebrity clients. Having said that, I have a check at Amazon and I just realized OXIA is currently available there – small dispenser. Whether Oxia is just another fad, it is hard to say so. Thirty years ago, people said bottled water manufacturers would simply close down within short time. Making people pay for things that formerly were free is just not easy. Why pay for water when they could get it from the tap. Why pay for cable TV when you can watch free-to-air programs? Yet, bottled water companies and paid cable TV business are still thriving. May be businessmen have run out of things to sell. Oxygen is a business item now. Anyway, if Oxia makes it big, I would think it is going to become the Evian of the bottled oxygen industry. May be Oxia can market its product more than being oxygen supplier. If I were the marketing director of Oxia, I will promote Oxia to be used for other things – to inflate balloons, to dry hair, to make bubbles in your drink and to heal the world by releasing it to the air to improve the Earth’s atmosphere. OK, I know – I am talking nonsense now. If you cannot get hold of Oxia or simply cannot afford it, no worry. Do this – go to a less crowded place, close your eyes, and breathe deeply through your nose. You will get the oxygen you want. Having said that, if you have money to kill your curiosity, you can get OXIA from Amazon. You may want to check out another of my review on similar product – How To Improve Your Cardiovascular Health Faster with YouBreathe, A Respiratory Training Device? Just wanna let u know that I love your blog and I follow it religiously. Its good to know that there are so many gymaholics out there. Ok back to Oxia. Well a sales rep from oxia actually came to give a free talk on the importance of oxygen at my office. According to them, by taking 3 puffs in the morning and 3 more before bed time, That would be sufficient for better complexion, appetite, energy, and yes eventually lose weight (possible?!) Their main selling point was for CPR and first aid kit. In a way I think its quite handy to have it at work places. But I have this thinking of, why pay for something if you can get it for free? For poor people like me, just do 15 mins of yoga breathing exercise every morning and you will be fine.